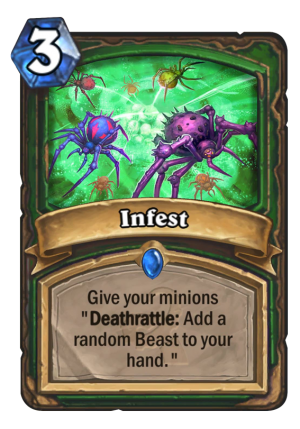 Infest is a 3 Mana Cost Rare Hunter Spell card from the Whispers of the Old Gods set! Give your minions "Deathrattle: Add a random Beast to your hand." The best part is the look on their face when you jump out of the cake! Err… corpse. Rating: 3.4/5. From 1437 votes. 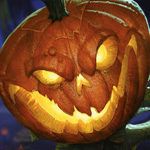 Will n zoth summon those cards that are infest? Better divine favor for Hunters. The minions on your board don’t even need to be beasts. i would say this card is great… in any other class. But hunter looks for face not for value. 2 stars sorry. Blizz is trying to hard to make a control oriented hunter when the very design of the hunter hero power begs for agro. Bliz needs to come to terms that when they made the different classes their meant to excel at certain aspects of the game. Randomness of beasts isn’t only issue. Drawing via deathrattle has also lack of tempo. 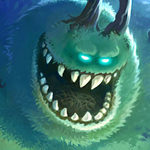 Not mentioning the fact you want go face in general so you want from your opponent to kill your minions and that is uncertain. So it is like Arcane Intellect with delayed unwarranted effect, which in some (rare) cases might be great. Well if you’re playing a face deck your opponent has no choice but to clear your board. This card might just be too slow for an aggressive deck but looking at WOTG, you can clearly see that they are aiming at à more control type meta. Or maybe you could just think for more than half a second and get that Blizzard is sick of face hunter and they want control hunter, which this card is obviously made for and much better in. Ball of Spiders + Infest = 6 random beast, I like it. For 9 mana? Not really worth the effort. Yeah, I botched that math. Changed the formula a few times (at first it was 3 Arcane Intellects and most of a Muster, dithered over exactly how much mana value to subtract over beast-randomness), but it’s not really relevant considering those values are estimates anyway. Actually, combining cards generally increases the mana value; for instance, 2*Arcane Intellect = 1*Sprint, but 3*2 =/= 7. In almost all cases, combining two cards into one has a mana cost of 1+ the combined mana cost of the two cards. Generalized, each extra card (after the first) adds an additional 1 to the mana cost. In this case, we have 7 + 3 (+1) + 3 (+1) = 15. 15 – 3 = 12. …Which also doesn’t equal 11. But pretty close.